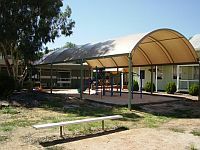 Meckering Primary School is a small rural school in the heart of the West Australian Wheatbelt and is a microcosm of the country lifestyle which surrounds us. The school has an administrator, 4 teaching staff members - full and part time -who are supported by 3 education assistants and a registrar/library officer. Our Staff is a mixture of youth and experience but whether they have been teaching for over 25 years or for just a few years the commitment to our students and to providing an education that meets the needs of each child is strong. 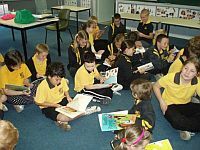 At the moment we have 31 students enrolled - 13 students in years 4-7, 13 students in years 1-3 and 5 students in the preschool years. Our small numbers allow for unique one-on-one teaching opportunities not available at other institutions. We pride ourselves on teaching our students to care for each other and the community as a whole. As a school we look to the future with enthusiasm, knowing that we have support for all we wish to achieve, both from our parent body and the local community.